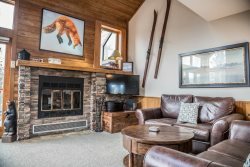 Caribou Highlands 124B is a newly renovated condo in the desirable Caribou Highlands Resort on Ski Hill Road. The bedroom features a queen bed and a sliding glass door out to the deck area. The unit was gut renovated in 2016 and features a stone surround wood-burning fireplace. The renovated kitchen has stainless steel appliances. The bathroom features a shower/tub combo. Caribough Highlands 124B is a 1 bedroom, 1 bathroom, 1 story unit at the Caribou Highlands Resort. Relax and take it all in on this deck. The sleeper sofa in the living provides an additional sleeping area so this unit can accommodate up to 4 guests. The kitchen also features a dishwasher, no need to hand wash dishes during your vacation. There is seating for four at the dining table. There are board games and books in the bedroom cabinet for you to enjoy during your stay. The deck expands the entire width of the unit. There are walk-outs from both the living room and bedroom onto the deck. The winter time view, during the summer this unit has great views of the outdoor pool. During the winter you can enjoy views of Eagle Mountain, Moose Mountain, Mystery Mountain, and peek-a-boo views of Lake Superior. Start your day on this deck enjoying the view of Eagle Mountain. View of the Birch and Cedar buildings from the outdoor pool area in winter. View of the Birch and Cedar buildings from the outdoor pool area in summer. The fitness center is located on the lowest level of the Alpine Building near the outdoor pool. The fitness center is great for getting in your work out while on vacation. The community gas grill is great for summer and warmer winter days BBQs. The playground at Caribou Highlands is fun for kids year round Note: may be buried under deep snow and not always accessible in winter. Below the Birch building is the indoor pool area. Enjoy the heated, indoor pool available year round. This area also has a hot tub and sauna. Enjoy a game of Ping Pong in the pool area. Book a spa appointment for a relaxing massage. The main lodge building at Caribou Highlands has a gift shop and restaurant. Moguls Restaurant and Bar is a great place to grab a bite to eat or enjoy a drink at the bar. Tahoe View at Caribou Highlands is a ski-in/ski-out condo located in the Birch building of the Caribou Highlands Resort. This beautifully remodeled 1-bedroom, 1-bathroom condo is the ideal getaway for a weekend ski trip or a summer time home base for your North Shore explorations. Fully remodeled in 2016 this main level unit features a tasteful kitchen with granite countertops and stainless steel appliances, a stone surround wood burning fireplace, and new hardwood-style tile flooring and carpeting throughout. Also enjoy the long, private balcony that looks out over the outdoor swimming pool, Lutsen Mountain Ski Resort, and the boreal forest beyond. The master bedroom has a queen-sized bed and the living room features a queen-sized sleeper sofa with adequate room for four guests. Here you are just minutes away from many North Shore attractions! This ski-in/ski-out unit puts Lutsen Mountains ski area right at your back door. During the summer the Alpine Slide and Gondola are popular attractions. Superior National at Lutsen Golf Course is just a mile down the road and features a full golf course in the summer and miles of fat bike trails in the winter. At Tahoe View you are surrounded by miles of hiking trails and a short drive to Temperance and Caribou State Parks. Grand Marais, with many quaint gift shops and dining options, is just 20 miles up scenic Highway 61. Cap off a long day of skiing or exploring at Moguls Grille & Tap Room, the resort restaurant and bar located just one building over, or at Papa Charlie's Restaurant & Tavern at Eagle Ridge Resort right next door. Both feature live music from popular area musicians throughout the year and are easy walking distance from the condo. Just down the road, a short drive away is the Lakeside Dining Room and the Poplar River Pub at Lutsen Resort serving breakfast, lunch, and dinner (including a full breakfast buffet). Many other dining options are available along the shore. Or stay at home and enjoy a meal in your renovated kitchen or have a summertime BBQ using one of the community grills. We loved this condo! It had a great location above/next to the indoor pool, having a small child this was very important and super convenient for us. The condo was at the ground level from the parking lot, which made transport of our luggage items very easy. Check in/out was so quick and easy too, having to go right to/from to the unit with no additional stops! The condo does run warm, but not any problem for us. The view is great, an easy walk to the main lodge/dining/fitness center/playground and ski-in/ski-out access right outside. The condo was obviously recently updated, it looks great. The only downside was having to clean up/remove trash before "check out", as we had to leave early morning, BUT this was also clearly stated when we made the reservation and in the instructions after booking, so it was no surprise and well worth the overall experience!